Submitted Photo The 2015 Miss River Days title holders. The annual Miss River Days Beauty Pageant was held Saturday night in the Vern Riffe Center For the Arts, where Brooklyn McBee, of Minford, was crowned the 2015 Miss River Days Queen. Whitney Jenkins, of Northwest, was also crowned First Runner-up, and Julianna Logan, of Wheelersburg, was crowned Second Runner-up. “It was the best in a long time, for me. The crowd was great even considering the rescheduling of high school football games from the night before,” said Lori Lowe, Miss River Days pageant director. The weather around the region prevented some high school football teams from playing their regularly scheduled games Friday night. In most cases the games were rescheduled for Saturday night. All of the contestants represent area high schools, with games being played Saturday night; it made people choose which to attend. Lowe said in some cases football players were part of the program. She said they had to find another way to fill those gaps. “We adjusted the schedule just a tad, but it came off very well,” Lowe said. Lowe said in the little pageant there were 47 contestants vying for 18 titles. 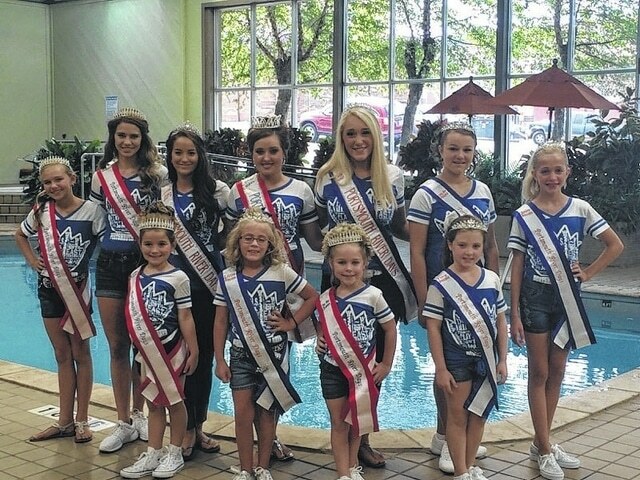 Those that received a title include, Baby Miss River Days Princess – Kynslee Gullett of Northwest. Baby Miss River Days Queen – Cora Greene of Minford. Wee Miss River Days Princess – Whitlee Swords of Northwest. Wee Miss River Days Queen – Scarlet Treadway of Minford. Toddler Miss River Days Princess – Brynn Neumann of Valley. Toddler Miss River Days Queen – Zeiden Osborne of Portsmouth. Tot Miss River Days Queen – Imogen Ferrell of Wheelersburg. Tiny Tot Miss River Days Princess – Mersadis Ngaruiya of Wheelersburg. Tiny Tot Miss River Days Queen – Bethany Summers of West. Tiny Miss River Days Princess – Isabella Rush of Valley. Tiny Miss River Days Queen – Breanna Messer of West. Little Miss River Days Princess – Loren Wheeler of South Webster. Little Miss River Days Queen – Mylee Jo Gleim of New Boston. Junior Miss River Days Princess – Autumn Picklesimer of East. Junior Miss River Days Queen – Riley Raynard of South Webster. Young Miss River Days Princess – Natalie Mershon of West. Young Miss River Days Queen – Laiken Skinner of Wheelersburg. They were also arranged in historical progression of the city, during the parade. Lowe said McBee is only the third girl from Minford to be Miss River Days. McBee said she was pleased with the results of her project, she said there were over 200 people in attendance. “My platform was Keep Calm and Cure on, where I held a ladies night out, with all proceeds going to the American Cancer Society to promote cancer awareness and prevention,” McBee said. Jenkins said her platform was STEM (Science, Technology, Engineering and Math) for kids. “I just wanted to create something that could get kindergartners through fifth graders involved in. For my community services project I held a STEM Saturday at Shawnee State University, we had over 70 little kids come. We had activities and experiments and a fund day,” Jenkins said. Jenkins said her River Days project has been invited to present at the Ohio Appalachian Higher Education Conference. “There will be 13 different states here and they asked me to package STEM for kids in a booklet and all of these deans from 13 different states are going to take it back. STEM for kids will be in 13 states,” Jenkins said. Logan said her community service project was a zombie 5k run. “It was super fun, there were 124 participants and we raised $1,200 that was donated to the SOMC Heart and Vascular Fund,” Logan said. Once new title holds are crowned they hit the ground running. Lowe said the group will be taking part in the Wellston Festival next weekend representing River Days. Lowe said they have already begun work on next year’s pageant and are working on creative ways to choose next year’s theme.